In this article we will study the Concept of internal audit. We will discuss its meaning, benefits and also the advantages and disadvantages of Internal Audit. Internal Audit is a process of evaluating and analysis of business operations conducted by audit staff and it is an independent activity within the organisations .It is a dynamic process which helps organisations to achieve their organisational goal and it helps them to prepare for final audit.Internal audit is conducted by management internal staff, who verifying accounts and deduct errors and frauds from financial statements. It helps management to prepare for final Audit. It helps in working review of the business. By verification and valuation of assets, it helps to protect assets. Internal audit helps internal check of accounting system. It helps in checking the errors and detection of frauds in financial statements prepared by the accounting staff. Determination of liability of the employees. It provides assistance to final audit. It helps in providing suggestions, creation of new ideas and special investigation of internal accounts of the company. Proper accounting system ⇒ Internal Audit is a proper accounting system which helps management to prepare for final audit. 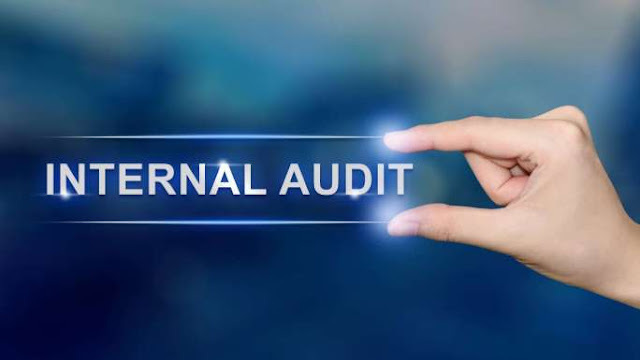 Helps in Progressive review ⇒Internal audit is the process of checking internal records of an organisation and it help in oeganisation progressive review. Improve efficiency and effectivenes ⇒ Identify redundancies in operational and control procedures and provides recommendations to improve the efficiency and effectiveness of procedures. Smooth External Audit ⇒ It ensures that the organization detailed standard policy and procedures are running smoothly. Deduct error and frauds ⇒ Internal audit helps to detect errors and frauds and provides suggestions to improve them which helps the management to take corrective action. Shortage of staff ⇒ In internal audit the organisational review is done by its own staff and their is short of staff. Lot of time required ⇒ Internal audit is a process of verifying internal accounts and it required lot of time . Control ⇒ Lack of control over standard of service.